WordSpring allows you to create word lists for spelling, word attack or decoding, fluency training, and vocabulary development. WordSpring provides lists for all the concepts that are essential to teach word attack and spelling. Here is an example of how you might use WordSpring to create word lists to help students learn the more advanced word attack or decoding skills of syllable division and accenting. Scroll down and select the syllabification category. 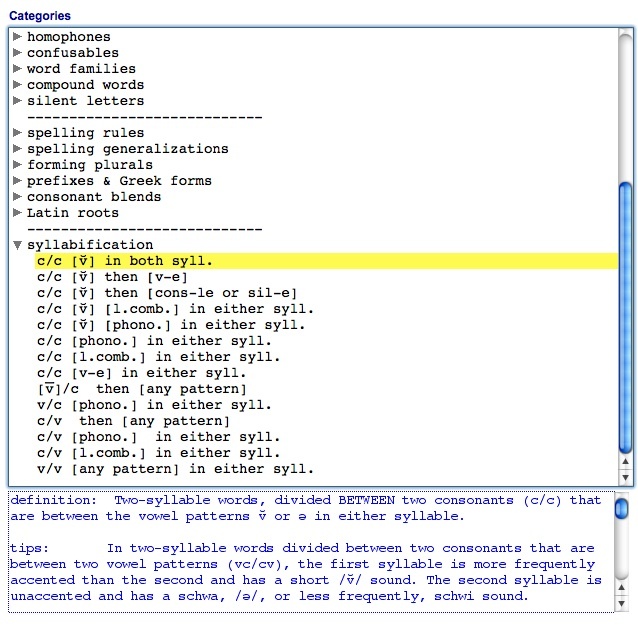 The four key rules for syllable division are described in blue below the Categories window. Also note the tips about the sequence of instruction. 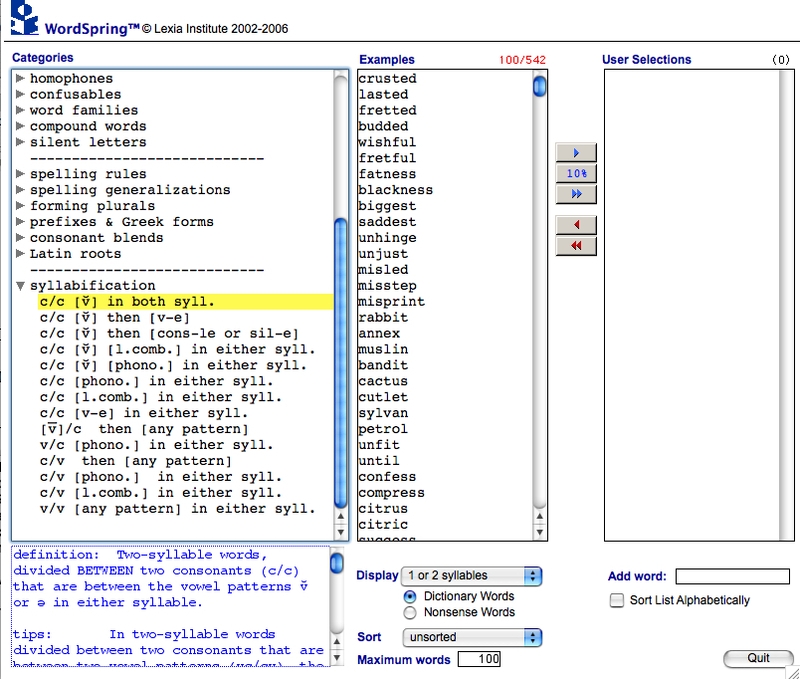 WordSpring provides lists for the four syllable division rules. If you clicked on the top c/c word pattern—c/c [v] in both syllables (divide between consonants when short vowel is in both syllables) —you would see, in the Examples window, a list of words that you might use in your lesson to teach the first syllable division rule. 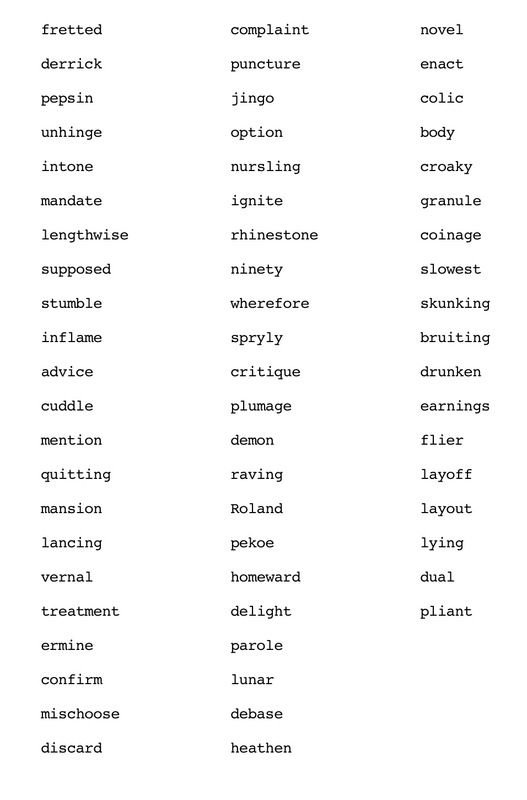 You can create your own list from these words. To do this, first move all the words to the Selections window by clicking on the button with the two blue arrows. Then you can remove words that might be too challenging by dragging them out of the Selections window. 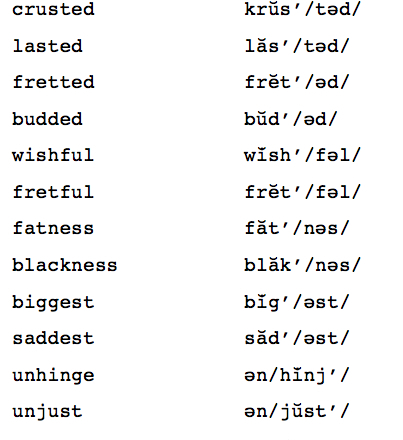 For example, you may choose to remove words your students might not know, such as damson, hyssop, Hypnos, and drachma. Now you are ready to print your list, in a choice of font sizes. 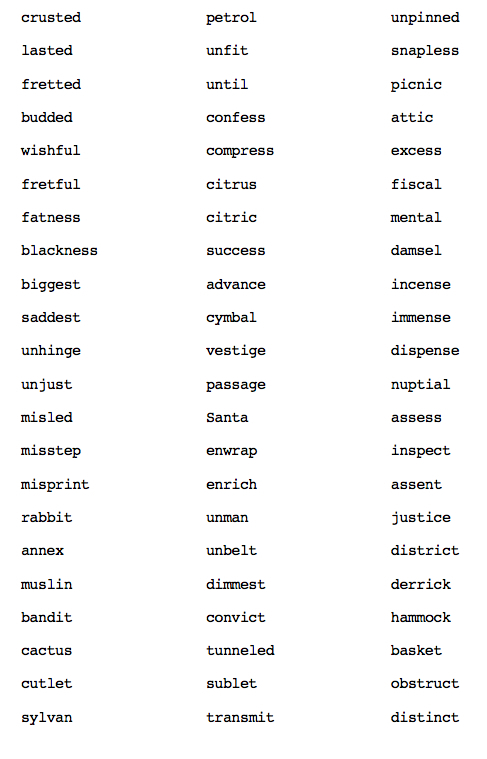 You might give this to your students for practice dividing words. If you wish to teach accenting at the same time, refer to page 101 of Carol Murray’s Scope & Sequence for Literacy Instruction, the textbook that accompanies WordSpring. 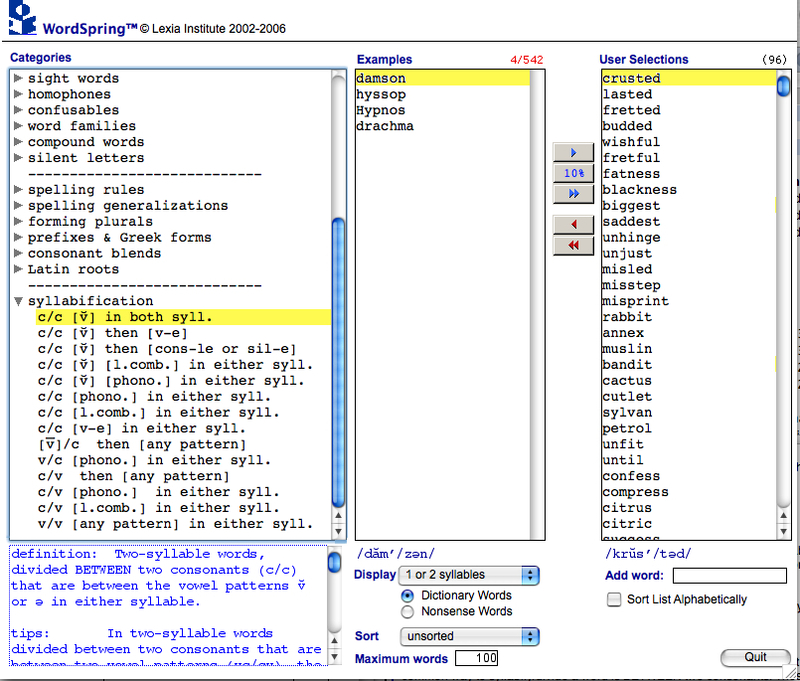 WordSpring shows the pronunciation and accenting of each word. This information can be printed out for student use. Note that most of the words are accented on the first syllable as predicted by Accenting hint 1 from Scope & Sequence. After you have taught two- syllable decoding using c/c words with one short vowel in each syllable, you might wish to select a different word pattern to provide additional practice. Look at the other seven choices for c/c decoding. If you click on the second subcategory, a list of c/c [v] then v-e words will appear. You can create word lists to teach all four syllable division rules by selecting words from the fourteen syllabification subcategories. 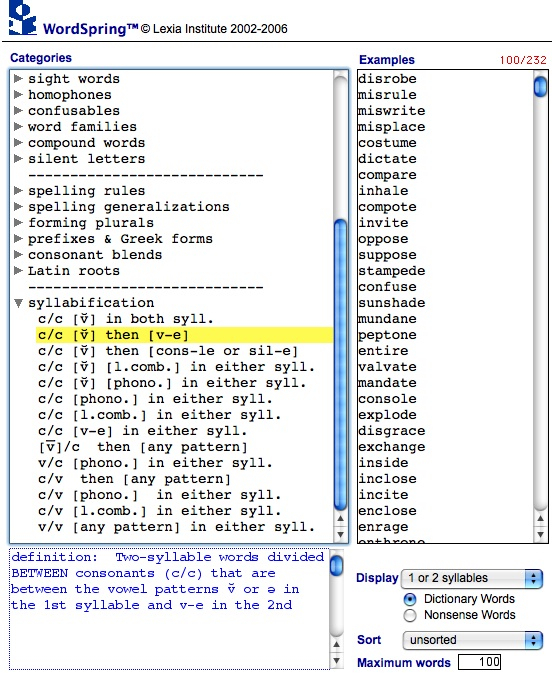 Or, after you have introduced all four syllable division rules you may want to create a list of examples from each of the four rules with words drawn from each of the fourteen syllable patterns available in WordSpring. Here is a list that you can bring into class to review the concepts you have taught. 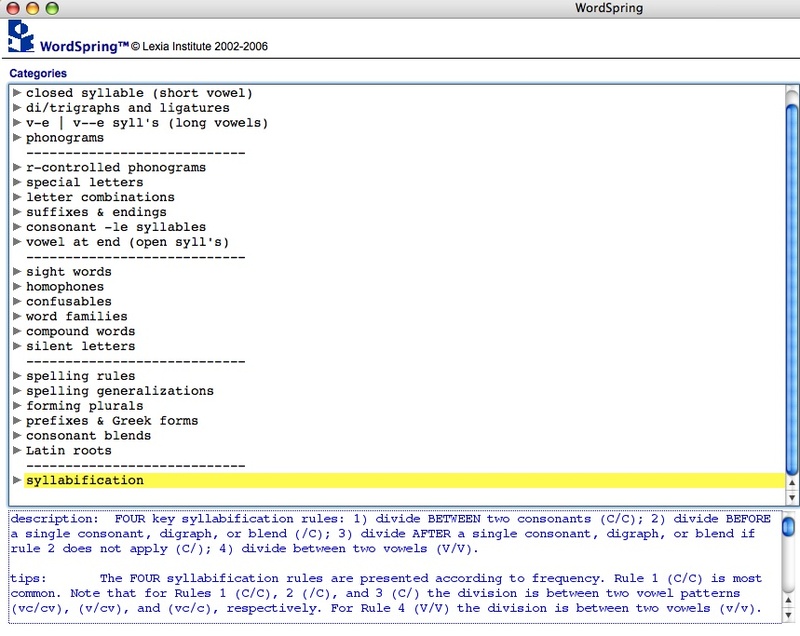 As this window shows, WordSpring provides lists for all the concepts that are important in teaching decoding and spelling. With WordSpring you can easily create lists for all your lessons.